Are SlimFast Keto Bars, Snacks, and Shakes Keto Friendly? At the time of writing this post I’ve been on the ketogenic diet for over five years, logged over 250 blood ketone tests, and evaluated over 300 products in an effort to estimate the effects of food and ingredients on my ketosis, including those in SlimFast Keto bars, snacks, and shakes. 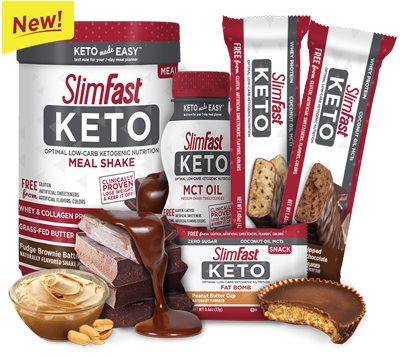 Is SlimFast trying to pull a fast one on us with their new Keto product line or did they actually get it right? In this post I'll evaluate SlimFast Keto bars, snacks, and shakes, give them keto friendly grades, and see how they stack up to similar keto friendly shakes, snacks, and treats! Percent of Total Calories from Net Carbohydrates: Since servings sizes often vary significantly, this is the most consistent metric of keto-friendliness. Net Carbs per Serving: What is a serving size and how many carbs are in it? Glycemic and Insulin Index of Ingredients: Not all carbohydrates and protein have the same effect on our blood sugar and insulin levels. Nutritional Density: Foods that are higher in percent of total calories from net carbs but are also high in nutrition per calorie can still be worth eating like broccoli. Easy to Overeat: Some foods are difficult not to overeat and require extra willpower to avoid overindulging which is an important factor to consider. Overall factors: SlimFast meal bars have Isomalto-Oligosaccharides fiber which I count 50% of as net carbohydrates because it has half the calories of sugar and a glycemic index of 35 which is more than half of that of table sugar. I'm not going to bother estimating how much of each bars fiber comes from other sources since it's mostly Isomalto-Oligosaccharides. Other than the meal bars, there are no hidden carbs worth counting. Most of these products are moderate in nutritional density. SlimFast really missed the mark with just about everything except their Keto Peanut Butter Cup Fat Bombs which are surprisingly keto friendly. As you can see from the chart, on the whole there is a pretty wide gap between SlimFast Keto products and real keto friendly treats and snacks. If you’re looking for a convenient, delicious, and ultra-keto friendly dessert my personal favorite is still ChocoPerfection. If you’re looking for more of a convenient snack or meal replacement, Keto Bars and F-Bomb nut butter pouches are my go to. For shakes with a fraction of the net carbs of SlimFast, I recommend Perfect Keto’s Chocolate / Vanilla / Salted Caramel Keto Collagen and MCT Powders. Otherwise check out the Keto Shop for more expertly curated and guaranteed keto friendly sweet treats, savory snacks, and more! Are Atkins Shakes Keto Friendly?